What if your school’s final exam forced you to kill your friends? A group of students at the Victor Von Doom Institute For Gifted Youths is faced with this question in Marvel’s Runaways miniseries, and, as the title promises, they decide to make a break for it instead of continuing their education. Writer Noelle Stevenson and artist Sanford Greene have done outstanding work channeling the spirit of Brian K. Vaughan and Adrian Alphona’s original Runaways series (arguably the best teen superhero comic of the new millennium) in this Secret Wars tie-in, building an emotional story around adolescents taking control of their destinies after discovering they are being deceived by a malicious authority. 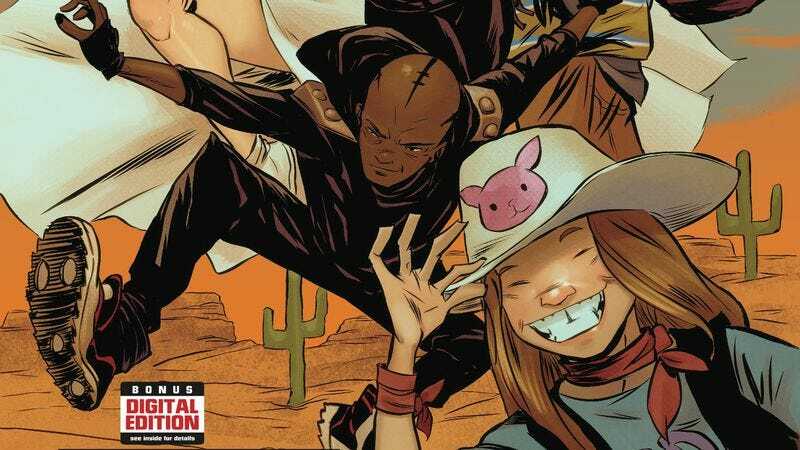 The most exciting thing about having a team on the run in Battleworld is that it allows the creative team to explore how these characters interact with the different environments of Secret Wars, and next week’s Runaways #3 takes the cast to The Valley Of Doom, the Wild West-inspired setting of the 1872 miniseries. This preview highlights the humor Stevenson brings to a fairly dark concept—she writes an especially good Molly, who is the only original Runaway to appear in the new book—and Greene’s energetic, expressive linework heightens the fun factor. John Rauch’s color palette of earth tones accentuates the dry desert environment, and he brings a lot of texture and dimension to Greene’s animated artwork. This creative team understands what makes the Runaways such a captivating superhero team, and hopefully this miniseries is the start of something more following the end of Secret Wars.